With a new edition recently released by Soft Skull Press, Jack Sargeant‘s Naked Lens is an engaging and essential examination of how the Beat literary movement shaped the underground film movement of the early ’60s and beyond. The Beat philosophy of freedom from conservative values, its reliance on spontaneity and its search for a godless spirituality was first expressed in film in the Jack Kerouac inspired and narrated Pull My Daisy by co-directors Alfred Leslie and Robert Frank and starred Allen Ginsberg and Gregory Corso. This seminal movie, along with John Cassavetes’ first directorial effort Shadows, exploded on the New York City avant-garde film scene in 1959 and inspired a wave of filmmakers known as the New American Cinema movement. While other underground film histories cover Pull My Daisy and Shadows to some degree, none go into as much depth as Naked Lens goes. Also, covering film history from a Beat perspective allows Sargeant to pull in other films and filmmakers left out of other historical narratives. Underground Film Journal: First up, what exactly was “revised and updated” between the 2008 Soft Skull Press version and the ’97 Creation Books edition? Jack Sargeant: There’s been three editions including the new one. There’s meant to be a Japanese edition and a Russian edition, although I have never seen either, so whether they have been translated yet or published yet I have no idea. The new edition has an additional chapter on the use of animation in bringing William Burroughs’ work to the screen, focusing on Ah Pook Is Here and The Junky’s Christmas. The new edition also has other odd bits added, a factual correction or whatever. It also has an appendix that looks at the relationship between Herbert Hunke and cinema. There’s also some new photos in this edition. UFJ: Most underground film histories follow a similar path, e.g. Deren to Anger to Brakhage, etc. What inspired you to focus on the Beat influence in underground cinema? JS: I think that conventional histories of cinema are too often tied to specific notions of film which is examined in isolation purely as film. I think that what attracts me to underground film is that it is part of a wider alternative culture. I don’t think it is possible to separate cinema from other parts of culture. So, to me, underground film is about film and the wider underground or counter-culture. Looked at that way, the beats were part of a cultural gesture that is echoed or reflected in the films mentioned in Naked Lens. To look at cinema simply as a historical process seems simply absurd to me. The concept of history suggests a rigid frame which is temporally specific and by extension is closed to debate. To me, the processes of the past are still under negotiation. It isn’t simply over, so looking at it as a history from A to Z seems to be indicative of a closure, both culturally in terms of the subject and intellectually in terms of the author’s engagement. I think film and culture are living, not simply frozen in the past for analysis. They can be revisited and explored again and again. The sense of living is also why I like the interview as a device, it gives the reader a sense of immediacy. As an aside, I was rereading the Re/Search books recently and the interviews in those books really are inspiring because of that sense of velocity and presence. UFJ: Why do you think some avant-garde/countercultural filmmakers, such as Peter Whitehead and Conrad Rooks, get left out of other underground film historical narratives? JS: Well, again this has to do with history, with closing down possibilities. Once history is written, to add to it is frowned upon by some. The underground has its canon and that is viewed with as much unquestioned respect as the canon of classical Hollywood cinema. This isn’t to say I dislike the canon, but simply that people want to feel safe so they don’t want to be the first person to look at something differently or extend it in a new way. I think Brion Gysin talks about that in Naked Lens when he discusses the relationship of the established underground film scene to his work with William Burroughs and Antony Balch. When I first met Peter he had been writing books and prior to that he was a falconer, so he has numerous aspects to his life, and I guess he didn’t fit the correct box for historians. Certainly his films, both those mentioned in the book and those others he has directed, are essential. I think the case with Rooks is probably similar. I first heard about his work in writings about psychedelic cinema. This said, the British Film Institute have released a DVD of Whitehead’s Wholly Communion. UFJ: Naked Lens works as a great companion volume to your previous book Deathtripping. Did you envision and/or write them to be complementary or were these always two completely separate works in your mind? JS: That’s interesting, I don’t really know. Certainly they were written separately and I had no idea when I sat down to write Deathtripping that I would write Naked Lens a year or so later, or that when I started working it would turn out the way it did. That said, I lived with the beat authors as an influence from a young age. I knew Balch’s movies produced with Sommerville, Burroughs and Gysin. I knew other movies in the book also. This was prior to writing either book. So, even if it wasn’t conscious, the ideas were implicit in my thinking. I don’t think you can read Burroughs as a youth then forget it. His writing is powerful and it affects you, so no doubt it contributed to the mise-en-scene of my mind albeit unconsciously as I wrote Deathtripping. I also think that when you create or write a book or whatever there is an implicit autobiographical aspect, so in the sense I am writing then they are parts of me and were written close enough together to reflect something about me or my state of mind at the time. UFJ: One thing Naked Lens seems to foreshadow in Deathtripping, is a certain contentiousness between some filmmakers, mostly parallels between Alfred Leslie vs. Robert Frank and Nick Zedd vs. just about everybody. Do you see these two battles as being coincidental or do you see some connection regarding certain types of artists who are creating challenging work? JS: I think it’s easy to say that certain types of artists may have a specific mentality, but I am not sure it’s true. Friendships grow and flower and die, I guess it’s part of life. UFJ: Do you have any extra insight into the Leslie/Frank split after speaking to the two men? Do you know what really happened there? JS: I don’t know, I guess the book covers it. UFJ: With the exception of Burroughs, it doesn’t seem like the other Beats wanted much to do with film post Pull My Daisy and some Andy Warhol films. Did you get a sense of why that was after talking to Ginsberg? JS: Corso and Ginsberg were writers who did other things. For example, Corso acted in a film What About Me? and Ginsberg took many photos, but I think that they were both writers first. But for Burroughs I think it was all equally valid, his scrapbooks, tape experiments, films, books, and art were all part of the same engagement. Of course he was primarily a writer, but you know sections of his books come from transcriptions from tapes or from scrapbooks. I think that Ginsberg was involved in many things in addition to writing, political causes and so on, so perhaps that took him away from film. UFJ: I read on your blog that you’re involved with a new DVD release of the Burroughs-inspired punk film Decoder, which you spotlight in the book. Can you tell me more about that project? JS: Well, my understanding is that it is all compiled, just waiting to be manufactured. As soon as it’s coming out I’ll make sure you’re told. It’s about time the film came out on DVD and, you know, I hope that it finds an audience. One thing that is interesting, when I wrote Naked Lens you couldn’t find most of the films in it, but now, many of them are available on DVD, which is great. These movies are out there and available and hopefully they’ll inspire a new generation of filmmakers. 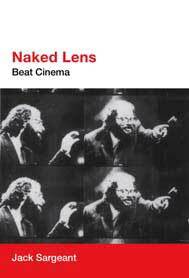 Buy Naked Lens: Beat Cinema at Amazon.com!